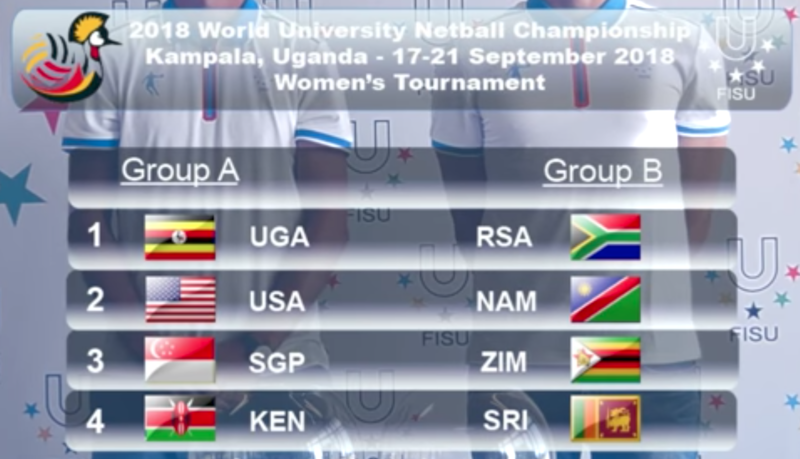 The Ugandan team were drawn in Group A for the third edition of the event, due to be held from September 17 to 21 at the Makerere University in Kampala. Group B features defending champions South Africa, Namibia, Zimbabwe and Sri Lanka. In their bid to defend their title from 2016, South Africa have named an entirely new squad. None of the 12 players headed to Kampala were part of that gold medal team from two years ago. Half of the new squad hail from the University of Pretoria, who are currently South Africa’s university netball champions. In the Ugandan squad, three of coach Rashid Mubiru’s players have just been crowned African netball champions with the senior team. Betty Kizza, Mary Nuba and Joan Nampungu will have gained valuable experience at the tournament and will hope to inspire their team-mates to home glory. The hosts will look to better their fourth place finish in the last World University Netball Championship held in Miami in the US after they lost the bronze medal match to the hosts. The event is held biennially by the International University Sports Federation (FISU). FISU works with host cities to organise the indoor women’s event.